How “organised” was the Jan Moir campaign? Was the campaign against Jan Moir that crashed the PCC website “heavily orchestrated”? Jan Moir herself thinks so. Was it “organised”? The deputy editor of the Telegraph said it was. If this was the case, who was organising this? “The big gay who runs the internet“? Stephen Fry? And what do they mean by organised? Functioning within a formal structure, as in the coordination and direction of activities. Affiliated in an organization, especially a union. Some people read the Jan Moir article and are offended; they forward it to their friends to express disgust. People complain to the PCC. They also complain to advertisers. After a while the expressions of disgust reach a celebrity, and a columnist. The celebrity mentions the article during a public appearance; the columnist writes a column about it. The columnist mentions the parts of the Press Complaints Commission code that the article breaks. Politicians pick it up too. More people complain. They also complain to advertisers. The ‘offence’ over the article now becomes a story in itself; the celebrity angle is key to selling the story. In a world without Twitter the above might unfold over a series of days. The difference in a world with Twitter is that the above process is accelerated beyond the ability of many people to see, and they think Step 4 is where it begins. But why does it matter if it’s organised? But of course this isn’t about definitions, but about the discourse of what ‘organised’ means in this context. It means ‘not spontaneous’; it means ‘not genuine’; it means ‘not valid’. Although different people may have different (oppositional, negotiated) readings I would argue this is the dominant one, where the discourse of ‘organised’ is being used to marginalise the protests. I will make a bet here that the PCC use that discourse in how they deal with the record numbers of complaints. 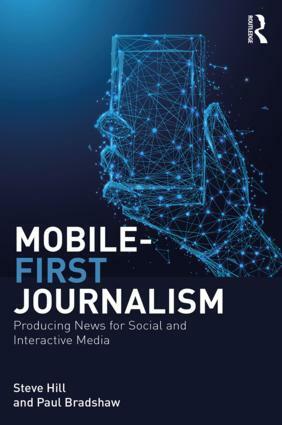 Stef Lewandowski hit the nail on the head when he said that it sounded “like the argument from design applied to social media”. But what would be really interesting here is to test the hypotheses against some evidence: I want to see just how organised the ‘campaign’ was. How important were the celebrities and the formal organisations? If you need an invite, let me know. And if you have any ideas how you can measure the organisation of a campaign like this, I’d welcome them. 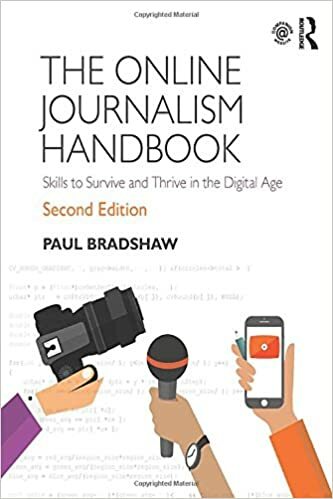 This entry was posted in newspapers, twitter and tagged #janmoir, daily mail, Jan Moir, PCC, Press Complaints Commission, twitter on October 19, 2009 by Paul Bradshaw. If you were following the Jan Moir-Stephen Gateley story that was all over Twitter today you may have come across a Twitter account claiming to be Jan Moir herself – @janmoir_uk. It wasn’t her – but it was a convincing attempt, and I thought it might be worth picking out how I and other Twitter users tried to work out the account’s legitimacy. The first test in these cases is the too-good-to-be-true test, and this works on a number of levels. 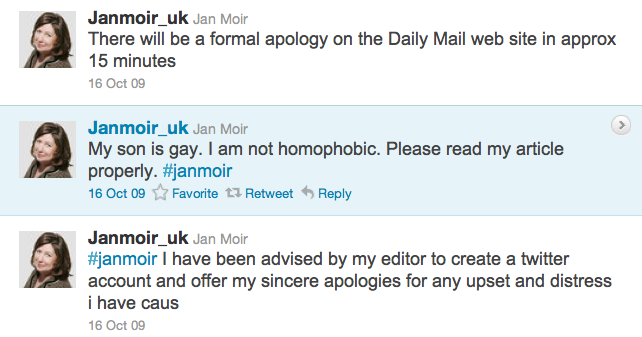 Jan Moir tweeting in itself was a great story – but not completely unbelievable. Her second tweet said “I have been advised by my editor to create a twitter account and offer my sincere apologies for any upset and distress i have caus” [sic] – a superficially plausible story. Would you buy it? This entry was posted in twitter and tagged #janmoir, daily mail, hoax, Jan Moir, Krishnan Guru-Murthy, stephen gately, the Daily Mail, todd nash, twitter, verification on October 16, 2009 by Paul Bradshaw.